The ferry between Hong Kong and Macau is the only practical way to travel between the two sister SARs. 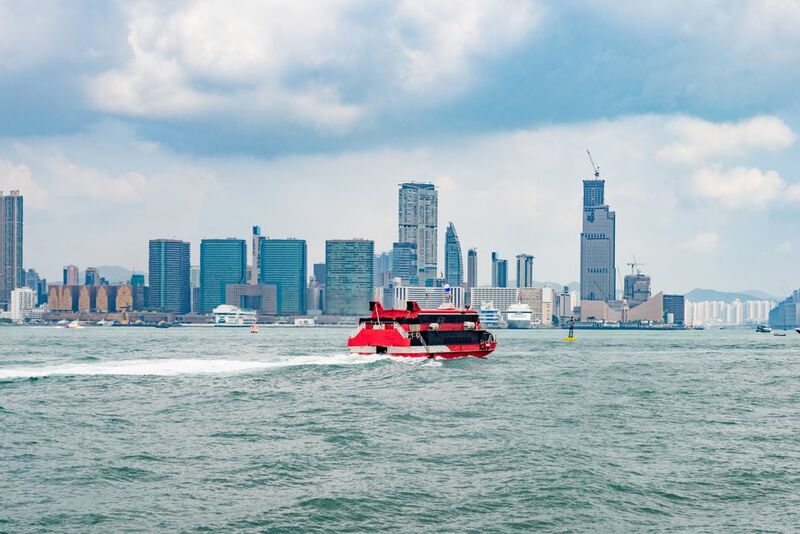 Below is all the information you need to catch the ferry between Hong Kong and Macau, including direct connections to the Cotai Strip. All ferries run from the Shun Tak centre in Sheung Wan on Hong Kong Island and from the China Ferry Terminal in Tsim Sha Tsui (TST) in Kowloon. The services from Sheung Wan are a little more frequent. Services to downtown Macau, known as the Outer Terminal, are run by Turbojet. This is the best destination for most hotels, restaurants and Portuguese parts of Macau. Services to the Cotai Strip, where many of the casinos can be found, are run by Cotaijet. The services at Cotai are met by complimentary casino shuttles to the Venetian and Sands Cotai. The most frequent route is from Sheung Wan to downtown Macau. This is also the only route that has regular night services. From Sheung Wan to downtown Macau: Every fifteen minutes from 07:00 until 23:59 with seven additional sailings throughout the night. During peak hours, holidays and festivals Turbojet lays on extra ferries to cope with demand. From TST to downtown Macau: Every thirty minutes from 07:00 until 22:30. There are no night sailings on this route. From Sheung Wan to Cotai: Every thirty minutes from 7:00 until 23:30. There are no night sailings on this route. From Kowloon to Cotai: This is the least frequent route with five sailings through the morning until 13:15. From Sheung Wan and TST the journey time is between 60-75 minutes, depending on sea conditions and whether you are on a standard ferry or faster catamaran. At the ferry terminals. Some hotels and casinos also offer ticketing options. With so many sailings there really is little need to book ahead from Hong Kong, and ferries are rarely full. Generally, tickets can be bought for the next sailing up to thirty minutes before departure. Rush hour services on Friday to Macau and late night services to Hong Kong on Friday and Saturday night can be busy and it is worth booking in advance which you can do online. This is especially true on weekends and during public holidays or major events, such as the Macau Grand Prix. What About Staying in Macau? Macau has plenty of attractions to keep you interested for a couple of days but accommodation options are limited. The big casino hotels are some of the best in Asia, but that's reflected in the prices. There are some cheap Macau hotels, but they aren't as comfortable as options in Hong Kong.